On 22nd June 1985 Airline agent Jeanne Bakermans checked in two pieces of luggage at Vancouver International Airport. Hours later, the first suitcase exploded inside the baggage terminal at Tokyo’s Narita Airport while being transferred to an Air India flight. Two baggage handlers were killed. Exactly 55 minutes later, the other suitcase exploded in the forward cargo hold of Air India Flight 182 as it approached the coast of Ireland. The attack, carried out by Sikh extremists campaigning for a homeland in northern India, killed 329 people, including 82 children. The fact Air India Flight 182 came down into the sea made it difficult for investigators. The devastated fuselage of the jumbo jet ended up 6,700 feet under the waves of the Atlantic Ocean. When the plane disappeared from air traffic controllers’ screens there were no immediate clues about what had happened. The pilot, Captain Hanse Singh Narenda, had not reported any problem with the Boeing 747, which was en route to London’s Heathrow airport from Montreal, having picked up a number of passengers and baggage from Toronto and Vancouver. But within days, Canadian investigators confirmed that a cockpit microphone had picked up a dull bang, a gushing noise and a human scream in the moments before the plane vanished. Examination of the 131 bodies recovered from the sea in the days after the crash showed no signs of any explosion, but investigators soon realised the bodies belonged to passengers who had been sitting at the rear of the plane. They were not killed by the initial explosion and some survived the terrifying dive into the sea, only to be drowned or killed by the extremely cold water. In the weeks following the crash, Canadian, British, Irish, French and Indian experts all volunteered their expertise in an attempt to find the wreckage, which might provide key clues. An underwater vessel scoured the ocean floor. 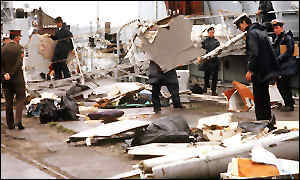 Eventually, on 12th July 1985, the black box was recovered. In October that year, salvage vessels recovered six more key pieces of fuselage. Investigators were able to use them to piece together what happened on Flight 182. Dr Christopher Peel, a world-renowned air safety expert from Britain’s Oxford University, told the Air India trial the damage to the plane was consistent with an explosion in the cargo hold. He said the bomb was likely to have been packed in a suitcase in cargo bin 52-left, which had been loaded in Vancouver and transferred onto Flight 182 at Toronto. Investigators traced back all luggages on the plane and the trail led to a brown Samsonite suitcase which had apparently belonged to a “Mr M Singh”. Ticketing agent Jeanne Bakermans told the trial she mistakenly checked his suitcase onto a Vancouver-Toronto flight even though he did not have a confirmed seat. She said he was very argumentative and, with a long line of impatient passengers behind him, she felt tagging the bag was her only option. In the event, “Mr M Singh” never boarded the plane, but his suitcase was loaded and then transferred to Flight 182. Until September 11, 2001, the Air India bombing was the single deadliest terrorist attack involving aircraft.